Nov. 28–30 (noon–5 p.m.) Join us for holiday cheer; warm up by the fire (both inside and out) and share a glass with friends as you settle into the holiday season. We have great gift and holiday food paring ideas. Free tasting of our newest release 2011 Tempranillo and a complimentary food paring to go along with it. Fee: none. Nov. 22–26 (noon–4 p.m.); Nov. 28 (11 a.m.–5 p.m.) Nov. 22–26: What better way to start the winter holidays than by warming up before or after the Festival of Lights than with a glass of EdenVale’s Winter Glogg. Join us at EdenVale Enoteca for a glass of warm Glogg, a red wine blended with mulling spices and orange essance for only $5. Nov. 28: Still looking for your perfect Thanksgiving Day wines for you celebration? Stop by Edenvale Enoteca and check out what we have selected as our Thanksgiving Day wines this season. We have paired five EdenVale wines with Thanksgiving Day-inspired bites. Fee: $15. Nov. 28–30 (11 a.m.–5 p.m.) We are having a Thanksgiving Weekend wine sale. Fee: none. Nov. 23 (11 a.m.–5 p.m.) There’s no better time to discover the Applegate Valley Wine Trail than during Southern Oregon’s best fall wine event. Enjoy 18 wineries, artisan food and fun at this self-paced barrel tour event. Time: 11 a.m. to 5 p.m. Purchase tickets online. Fee: $44 (includes wine glass; wine trail tour). Nov. 28–30 (noon–5 p.m.) Join Ledger David Cellars for our Thanksgiving Weekend Open House event. Kick off your holidays with fall comfort foods paired with our mulled Sangiovese wine, seasonal baked goods, live music and wine specials. Enjoy our signature Primoris Chenin Blanc and other award-winning estate wines. Just five minutes off I-5, left on exit 35 next to the World Famous Rogue Creamery. Fee: none. Nov. 28–30 (11 a.m.–5 p.m.) Complimentary tastings, new releases, appetizers and holiday gift selections. Fee: none. Nov. 28–30 (11 a.m.–5 p.m.) Pizza oven apps to pair with wines, plus holiday discounts. Fee: $5. Nov. 23 (11 a.m.–5 p.m.); Nov. 28–30 (noon–5 p.m.) Nov. 23: All of us at Schmidt Family Vineyards enjoy this very well attended event each year. This year there will be a special Barrel Tasting and a featured wine (available for purchase this day only), plus a food pairing. Fee: $44 (includes wine glass; wine trail tour). Nov. 28-30: We open our doors to our extended family, you. Join us for some fine wine, hearty food and new inventory in our boutique. All in front of the cozy fireplace … Cal will make his special recipe of Turkey Chili (free) to go with our featured wine for the weekend. Nov. 23 (11 a.m.–5 p.m.) Discover the Applegate Valley Wine Trail during Southern Oregon’s best fall wine event. Enjoy 18 wineries, artisan food and fun at this self-paced barrel tour event. Time: 11 a.m. to 5 p.m. Purchase tickets online. Fee: $44 (includes wine glass; wine trail tour). Nov. 28–30 (noon–7 p.m.) You are welcome to join us for our open house featuring food pairings with all tasting flights. Fee: none. Nov. 28–29 (noon–4 p.m.) Sumptuous foods paired with EdenVale’s wines to be enjoyed in the atmosphere of the historic and beautiful Voorhies Mansion. Hosts Rich Scheffel, Aaron Nino and our chef, Douglas Todd, ensure an afternoon of great conversation, food and wine for sharing with friends and family. This is a holiday tradition you won’t want to miss. Fee: $20; $10 (club). Nov. 29 (noon–5 p.m.) Join us this Thanksgiving Weekend. Fee: none. Nov. 29 (11 a.m.–5 p.m.) “A Night at the Met” Tenor David Gustafson, internationally recognized for his opera singing, will perform an evening of opera’s most passionate offerings. Violinist Yvonne Hseuh will perform a number of solo pieces with accompaniment by pianist John Jantzi. Fee: $30 (advance reservations only; includes appetizers). Nov. 23 (noon–4 p.m.); Nov. 29–30 (noon–5 p.m.) Taste the Twelves: 2012 Triple Oak Vineyard Pinot Noir and Tempranillo. Nov. 23: Annual Oakland Antique and Wine Walk. In the heart of Historic Oakland on Antique Row, discover the hidden treasure that is Oakland gateway to your wine country tour, shop and taste the wines of the Umpqua Valley. Fee: none. Nov. 28–29 (11 a.m.–5 p.m.) Join us for our annual Holiday Open House. 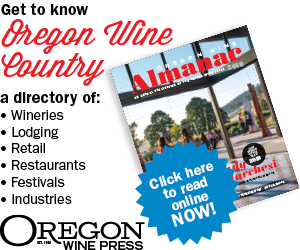 Skip the crowded malls and visit Abacela in the beautiful Umpqua Valley. Fee: $15; $7.50 (club); (includes logo glass, light hors d’oeuvres). Nov. 22–23; Nov. 28–29 (11 a.m.–5 p.m.) Music, appetizers and barrel tasting. Nov. 28–30 (11 a.m.–5 p.m.) Join us for our Thanksgiving Weekend Open House. Sample special releases paired with the perfect food. Take advantage of 20 percent case discounts and more. Fee: $10 (includes wine glass and food pairings). Nov. 28–29 (11 a.m.–5 p.m.) This Thanksgiving Weekend, enjoy great food and wine pairings as while checking out our fabulous gift boutique. Fee: $10 (includes wine glass). Nov. 28 (10 a.m.–5 p.m.) Tasting of four wines paired with bite-sized appetizers and tour of wine cave with live music. Fee: $10. Nov. 28–30 (11 a.m.–5 p.m.) Come out and try our newly-released Tempranillo, Claret and Petite Sirah, while also previewing our next Malbec, and a couple of new varietals: Anyone heard of Alicante Bouschet and Mourvèdre? Fee: $5. Nov. 28–30 (11 a.m.–5 p.m.) Our annual Thanksgiving open house weekend. Come enjoy wine tasting including library and magnum wines. We have live music, light appetizers and great wine specials. Gift shop has many holiday gift selections. We have something for everyone. Fee: $5. Nov. 28–30 (11 a.m.–5:30 p.m.) Join us Thanksgiving Weekend as we celebrate the season. The tasting Room will be all dolled up for the holidays and our pizzas will be available to purchase to pair with our award-winning wines. Bring your friends and family. Bring your Christmas shopping list. We ship. Fee: none. Nov. 22 (1–5 p.m.) Join us Thanksgiving Weekend. Wood artist extraordinaire Bill Saily demonstrates intricate wood carving techniques. Bill’s works are uniquely carved from single wood blocks in detail. Music and tasting treats provided. No event or tasting fees. Fee: none.